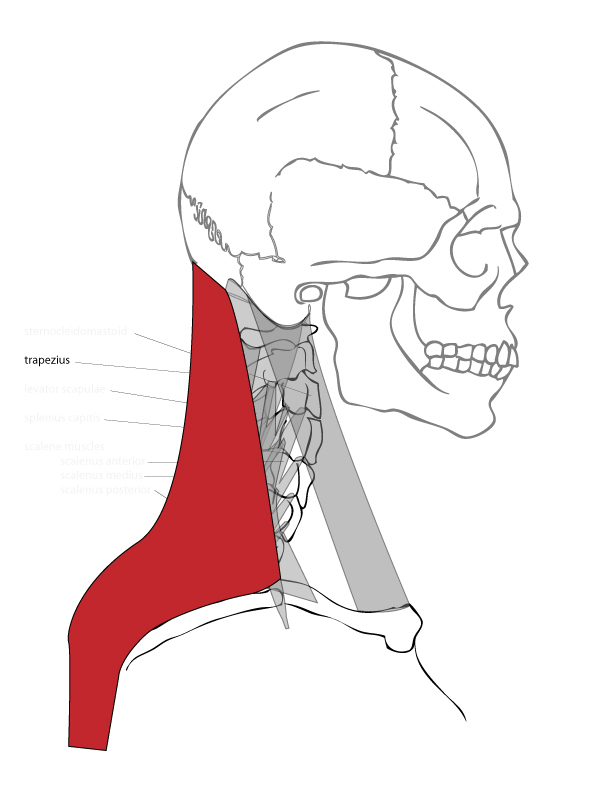 In part one of the anatomy of the neck we looked at a few of the muscles that shape the neck. Here is another view of those same muscles. In part one, we saw the muscles as viewed from the side. 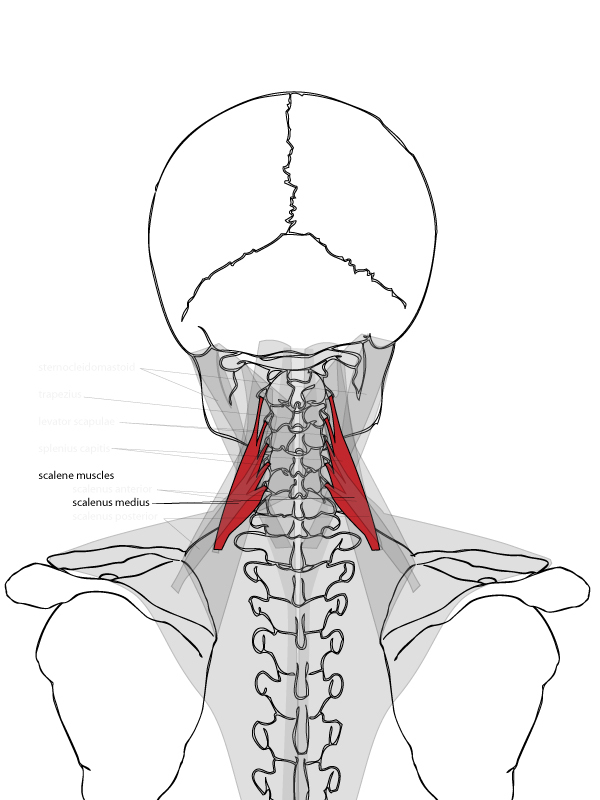 In part two, I will illustrate those same muscles viewed from the back, or the posterior view. 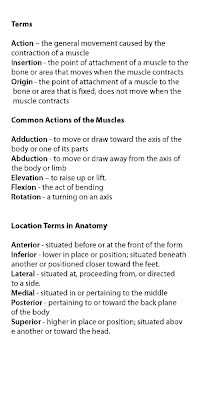 Along with the new diagrams I will list the origin, insertion, and action of each muscle as I did in part one. We will cover the muscles in the same order we did last time. 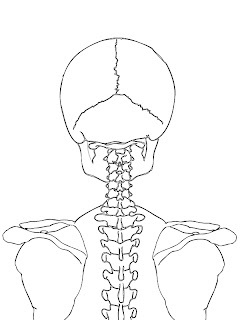 We start with the diagram of the skull and spine to show the structure that the muscles connect to. Looking at these muscles from a posterior view, one of the first things we may notice is that these muscle come in pairs. This is true of a large portion of the muscles in the body. If there is a muscle on the left side of the body there often is a counterpart on the right. As we continue to look at the anatomy of the human body, we will see how much this left right symmetry carries though out the body. 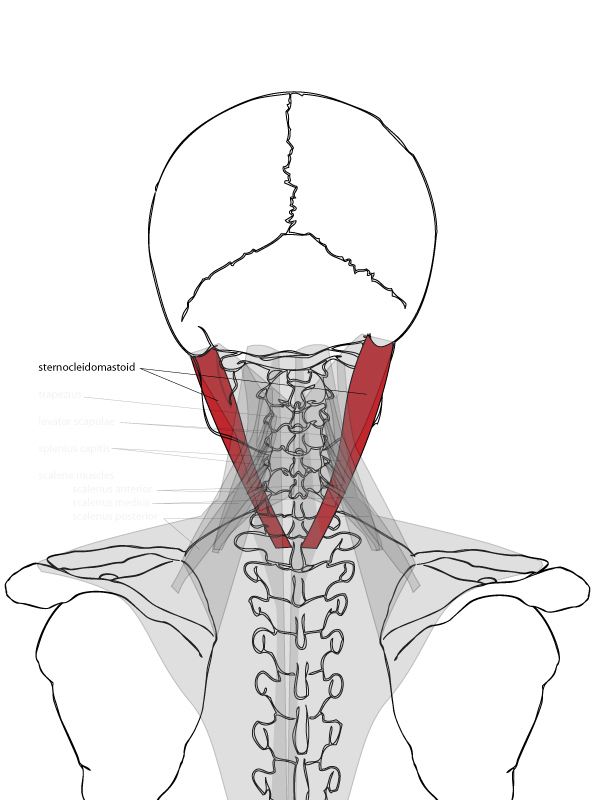 Seeing the sternocleidomastoid from the back the V-shape that the pair of muscles make is more apparent. The two rope-like muscles are wider at the top near the base of the skull and tapper in until the two almost combine just above the sternum. Notice that even though these are neck muscles the origin and insertion points are not on the spine. 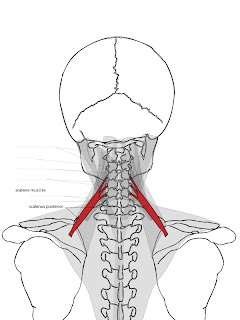 This is because the muscles rotate the head and they use the rib cage and clavicles as a fixed location to pull the head to the left or right when contracted. 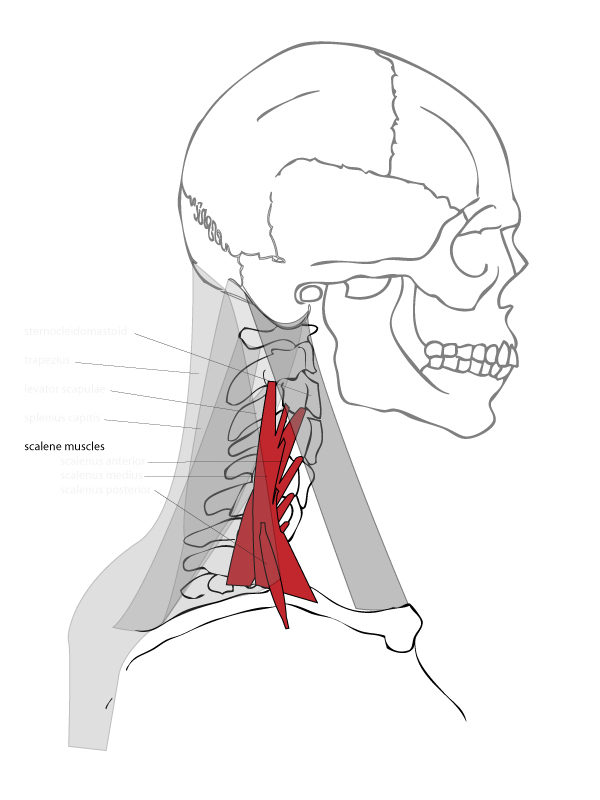 This muscle is the reason the diagrams include a large portion of the scapula and more of the spine below the neck. 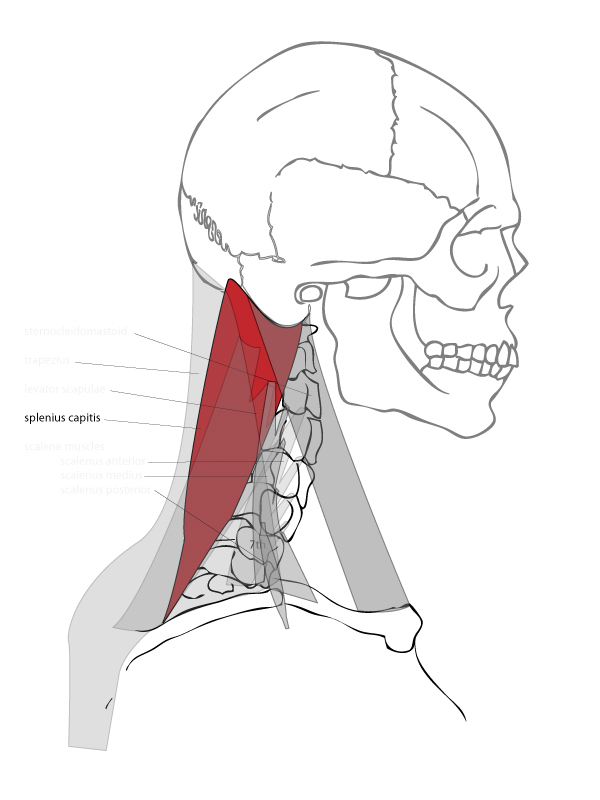 The trapezius is a large muscle that spans across the neck and the back. 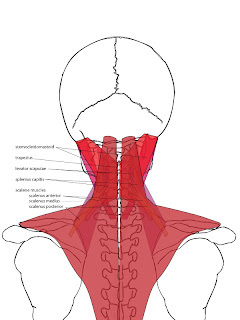 It gives shape to the back of the neck and the upper back. It starts out like a couple of ropes running down the neck but quickly turns into a fan shaped muscle as it spreads across the back. 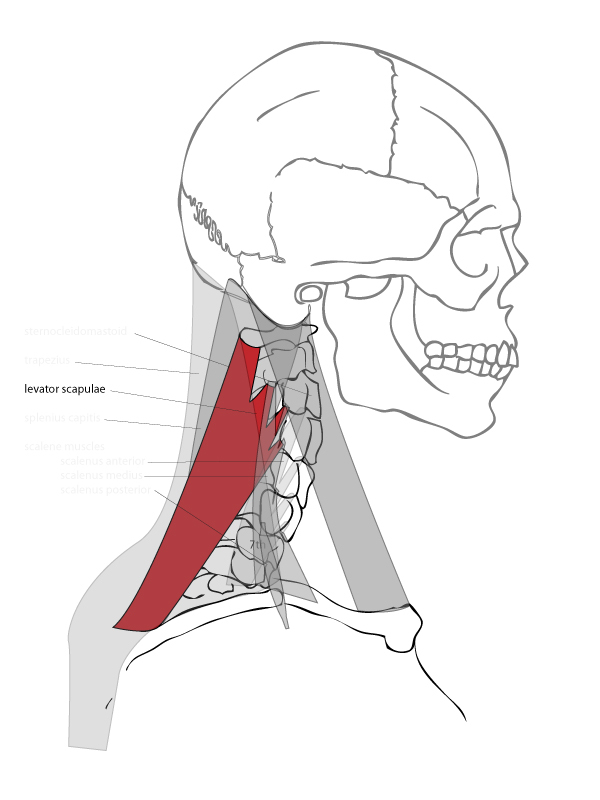 Not apparent in the side view is the fact that the levator scapulae are a pair of muscles. 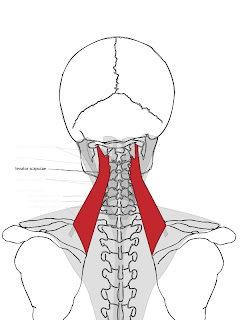 These muscles connect the neck to the shoulder blades (scapula) and can be seen within the shape of the neck. 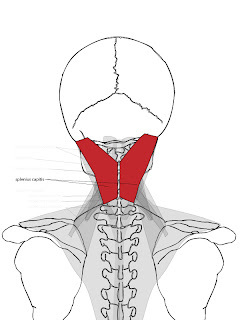 Though they are not as readily visible as the trapezius or sternocleidomastoid muscles. 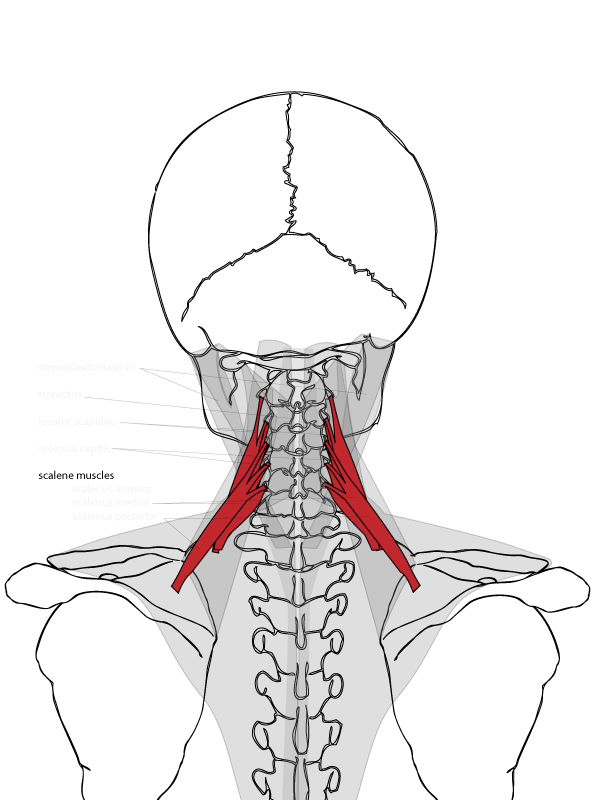 Another pair of muscles that rotate the head. 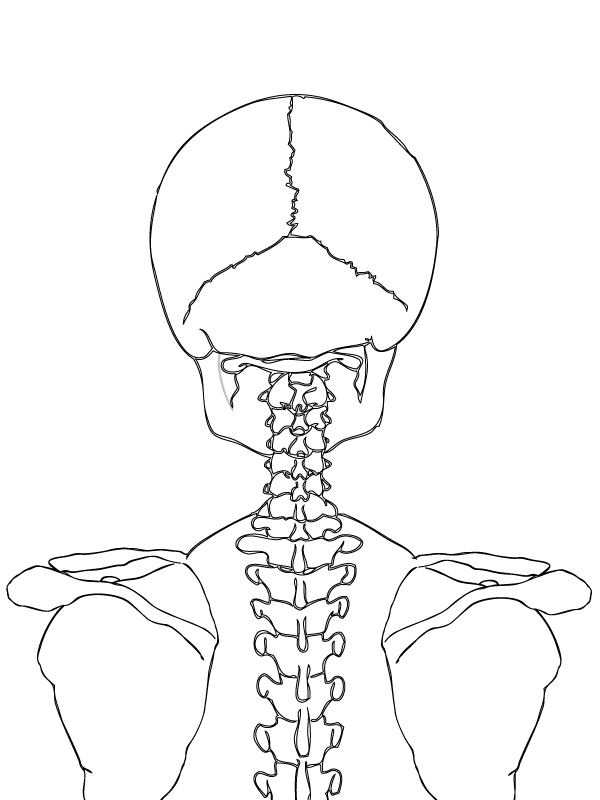 This time the two are attached to the skull and the spine, giving the action of these muscles less range of movement. The splenis capitis are more muscles giving shape to the back of the neck. 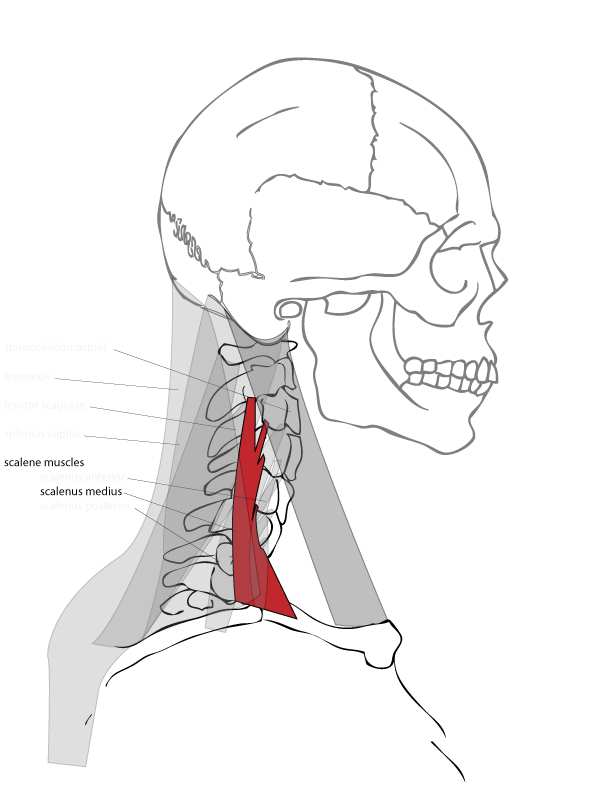 The scalene muscles are deep muscles. 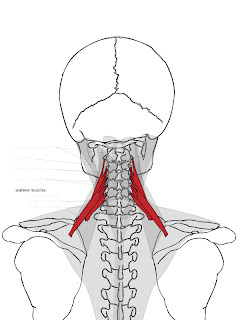 These are muscles that are covered by other muscles and are not readily visible on the surface of the neck. 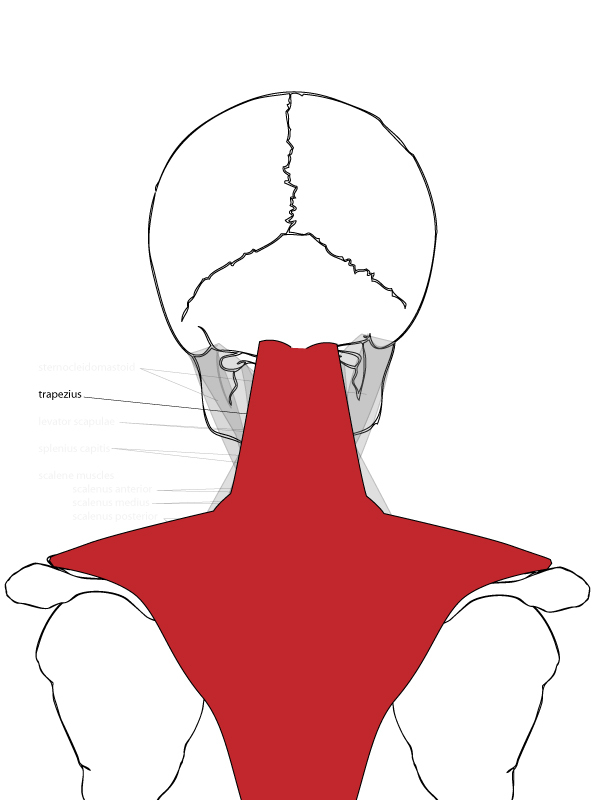 The deep muscles may be completely or partially hidden but that does not mean that they don't contribute to the shape of the neck. Their impact on shape is just a little less direct. 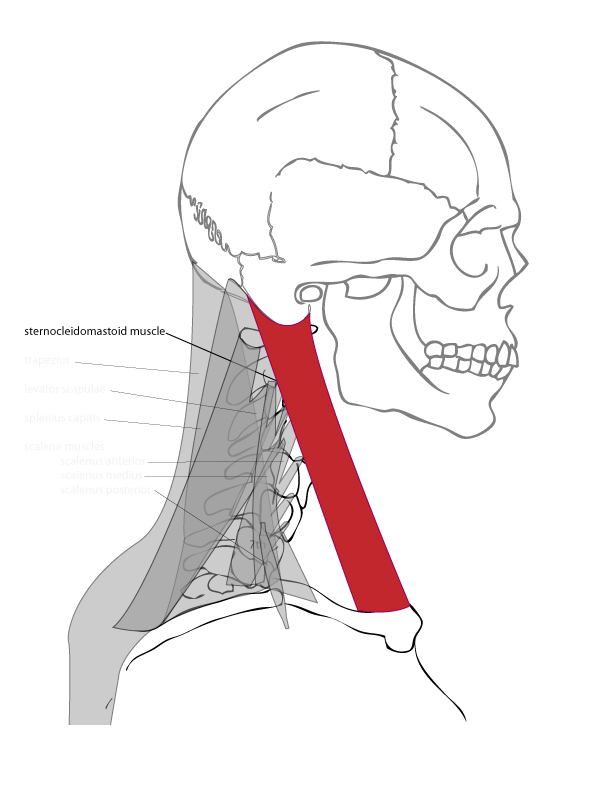 From this view we can get a better understanding of where the scalenus anterior are positioned on the neck. 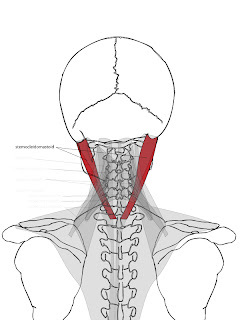 These muscles connect to the transverse processes of the vertebrae, the outer edges of the vertebrae. 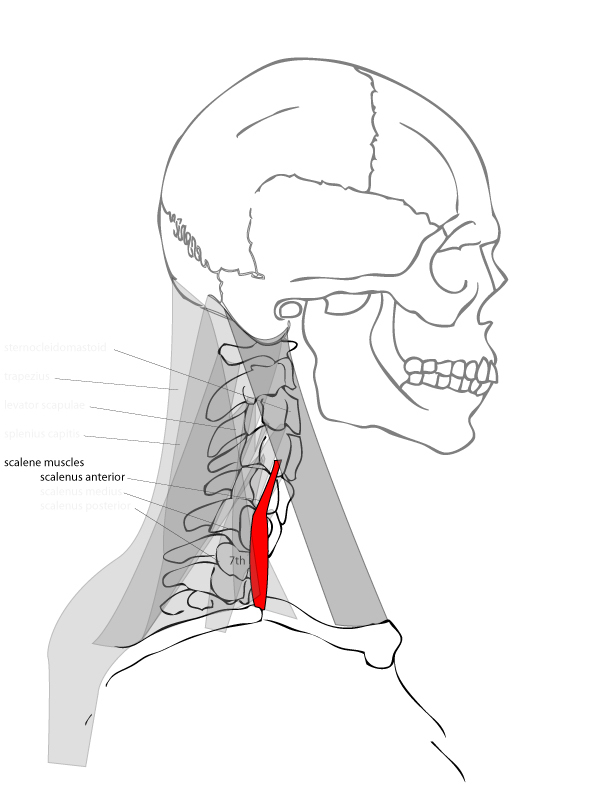 The scalenus medius connect to the first rib from the vertebrae of the spine and they pull the head left or right when contracted, using that rib as leverage. Unlike the other scalene muscles, the scalenus posterior connects to the second rib. This muscle connects to the spine and pulls the head down and to the side when contracted. Both the side and the back view will give us a better sense of the forms these muscles create. This can also guide us in figuring out how each muscles changes shape when the body moves. 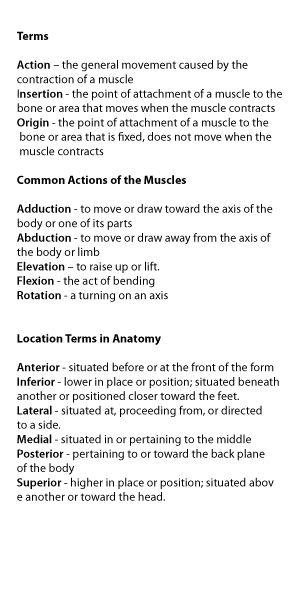 In turn, we should be better able to identify the muscles and use them to create the shapes found within the model.